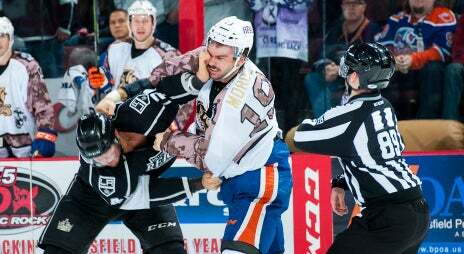 The Ontario Reign (8-2-2-0) fell to the Bakersfield Condors (5-6-0-1) in a 3-0 defeat at Rabobank Arena Saturday night. The loss snapped the Reign's three-game winning streak. The Condors opened the scoring 11:57 into the first period as veteran Ryan Hamilton slipped a shot past Reign goaltender Ray Emery (22 saves) from between the faceoff circles for his fifth goal of the season. Less than two minutes later, the Condors forced a turnover behind the Reign goal line and Kale Kessyknocked in the loose puck for a 2-0 advantage at 13:53. In the second period, the Reign showcased their AHL-leading penalty-killing unit, denying the Condors on back-to-back man advantages. Forward Jonny Brodzinski nearly cut the lead in half midway through the frame, but rang the post over the glove of Condors netminder Laurent Brossoit (22 saves). Condors forward Braden Christoffer sealed the victory with and empty-net goal at 18:27 of the third period. The Reign finished the contest 0-for-2 on the power play while the Condors went 0-for-3.